There are eight types of thrashers in North America. The Brown Thrasher is the most common and can be found in most southern areas of Canada except for British Columbia. They are also found in the central portions and eastern regions of the United States throughout Mexico. 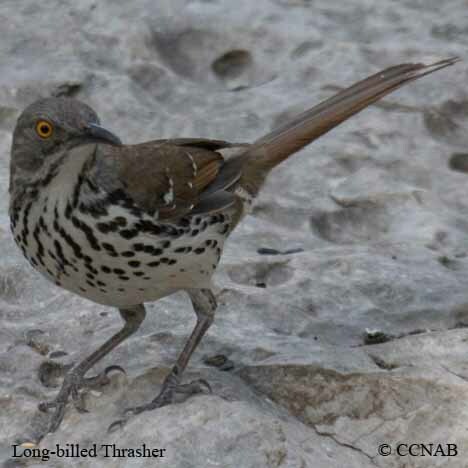 The Sage Thrasher is the only other thrasher that may be seen in the southern regions of Alberta and British Columbia. The remainder including the Bendire's Thrasher, California Thrasher, Crissal Thrasher, Curve-billed Thrasher, LeConte's Thrasher and Long-billed Thrasher live in the southern states and into Mexico itself. Most often thrashers feed on the ground. Six of the species have glaring yellow eyes but the California Thrasher and the LeConte's Thrasher have dark-coloured eyes. These shy long-tailed and long-billed birds are quite hardy and survive among the undergrowths in a hot dry climate but can occasionally be enticed into an opening around birdfeeders.